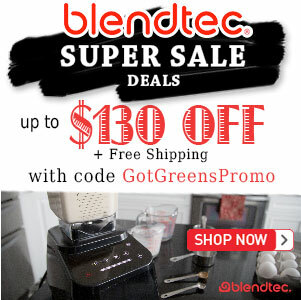 Blendtec vs Ninja - Got Greens? We put the Blendtec vs Ninja head to head to see how they really compare. Learn the details of how these popular blenders compare. Just because a blender is more powerful and can perform more tasks does not necessarily make it the better choice for YOU. The Blendtec is widely known and considered by many to be in a different class than the Ninja. But, if you are not going to use the power and features that command a higher price then why spend the extra? But if you need more out of your blender then you can’t ignore the difference. 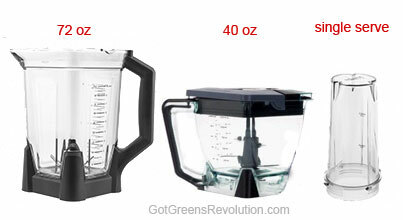 Dimensions 15.5" x 7" x 8" 18.1" x 6.7" x 10.6"
Blendtec vs Ninja Blender – Performance and Features. Blendtec has significantly more powerful with its 1560 to 1725 watts of power. The Ninja comes in with 1000/1500 watts which is more powerful than most blenders (pay very close attention to which specific model of Ninja you are looking at, as they vary in power even when they look exactly the same). Blendtec has up to 10 speeds ranging from about 4080 – 28,000 RPMs. The Ninja has 3 speeds with the high speed reported to be about 24,000 RPMs. With regard to common blending tasks like making mixed drinks, crushing ice and blending fruits, both Blendtec and Ninja blenders can easily get the job done. Blendtec boasts the "one blade does it all" and can grind grain and do dry blending. The Ninja can not handle grinding grains nor does it make hot soup like the Blendtec. Blendtec blenders can easily handle anything you put in it, pretty much always resulting in a completely blended smooth creation. If you are just making drinks and fruit smoothies, the Ninja can pretty much do the same. But the Ninja Professional has trouble with more demanding tasks such as frozen blends and nut butters. If you were wanting a smooth and consistent blend, the Ninja struggles. This is most likely caused by the 6-blade tower design that does not allow for the creation of a Vortex. 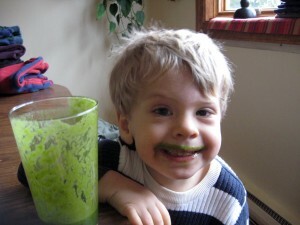 Oftentimes it requires that the blender be stopped in order to push and mix and ingredients into the blades. Upon making blends with greens or seeds, the Ninja just isn’t able to process them smoothly like the Blendtec can. Ingredients don’t efficiently move between the blades easily and don’t get processed completely, resulting in chunks. Both these blenders are louder than most common kitchen blenders. When you are investing money in an appliance such as a Ninja or Blendtec a major consideration is the warranty and coverage. With so many products on the market you want to be sure your blender can stand up to regular use for years to come. Blendtec blenders come with a 8-Year warranty that covers everything included in the box at the time of purchase. 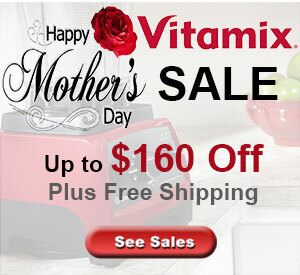 They have been making blenders for about 6-years and all are designed and assembled in the USA by K-Tec out of Utah. Ninja blenders are made in China by the Euro-Pro Operating LLC company originally founded to manufacture vacuums. The Ninja 1100 generally comes with a 1-Year limited warranty although you sometimes can get a promotional 2 or 5-Year warranty. Ninja blenders have been on the market in North America for about 3 years. While Blendtec blades and its housing is made of metal, you won’t find too much metal on the Ninja. The Ninja center post, or "tower" that holds the blades is made of plastic, and there have been complaints made by consumers that this part splits or breaks under heavy use. A nice benefit to both the Blendtec and Ninja blenders is that all their jars are made of BPA-Free plastic. 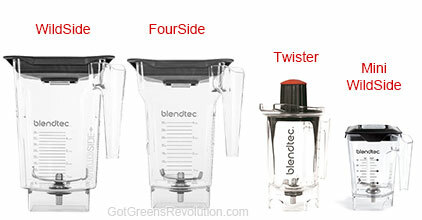 Upon purchasing a Blendtec you can choose the standard 2 qt. FourSide Jar or the large 90 oz. WildSide Jar. There is also a smaller, specialty, Twister Jar available. A 72 oz. container is included with the Ninja Professional and the Ninja Mega Kitchen System also comes with the 72 oz. pitcher and includes an additional 40 oz. Bowl. This specialty bowl comes with Dough Blade and Paddle attachments for making and mixing dough. Ninja blender manuals all state that you can fill their containers to capacity for blending. Blendtec recommends operating their blenders at half the volume of the jar being used. Blender Controls and Ease of Use. A highlight of Blendtec blenders that you won’t find on the Ninja, nor most other household blenders, is programed blending cycles. With its microprocessor controlled Smart-Touch Tec-nology™, you are able to push a button and have the Blendtec run through a hands-free programmed blending cycle. You choose the task you wish to perform and the blender automatically controls the speeds and duration of the cycle to complete it. Blendtec also comes with a digital display showing you blend cycles as well as allowing a selection of pre-programmed blend cycles. Getting ready to use your Blendec is extremely simple. Just put the desired jar on the blender base, add ingredients, push the top on, and push the button for the cycle you would like to use. While it may be the blender with the most safe-guards, the Ninja requires a few more steps and time to get ready to use. In order for the power to be activated, the blending container must be perfectly aligned and rotated into place. As well, the lid has a locking handle that must also be correctly aligned to satisfy the safe operating feature prior to the blender getting any power when buttons are pushed. Also, the blades are very sharp and need to be handled with care. The Blendtec will automatically shut off at upon completion of the blending cycle. If you choose to use the step buttons to manually blend then it will automatically shut off after 50 seconds of continual blending. One a blending button is pushed on the Ninja it will continue to blend indefinitely until you turn it off or until a thermal protection switch is activated to turn it off before it overheats. Cleaning up after using either of these blenders is very easy. Generally after use and an initial rinse of your blending jar, just add warm water and a touch of detergent and blend on high for about 10 seconds. Finish cleaning with a thorough rinse and a quick hand wash if necessary. Another benefit of the Ninja with regard to cleaning is that all the blades and attachments can be easily removed for cleaning. This is not only convenient but also proves necessary as some hand washing is typically needed due to the design of the blade tower. The containers of both the Blendtec and Ninja can be put in the dishwasher for extra cleaning – but only on the top rack! With the extreme temperatures that some dishwashers operate, it is not uncommon to get a warped container as a result of washing it on the bottom rack. We personally advise against any dishwasher use and suggest hand washing of containers. No matter what blender you have the most important thing with regard to easy clean up is that you rinse you blending jar immediately after use. Of all the blenders on the market, the Ninja is likely the most versatile for under $200. It is a blender made for light to medium use and it won’t break the bank. Blendtec blenders are consider to be the most powerful blenders made for home use. Professional kitchens, coffee shops and smoothie bars have been relying upon them for years. The Blendtec is capable of blending any food product and has become popular because of its program cycles and durability. Please +1 and LIKE us then share how our review has helped you. Which do you Choose? BLENDTEC or NINJA – Why? your foreign blender needs years of use to compare to blendtec .